Puri: Noted sand artist Sudarsan Pattnaik sculpted a sand art of ailing Dalai Lama at Puri sea beach here on Wednesday. 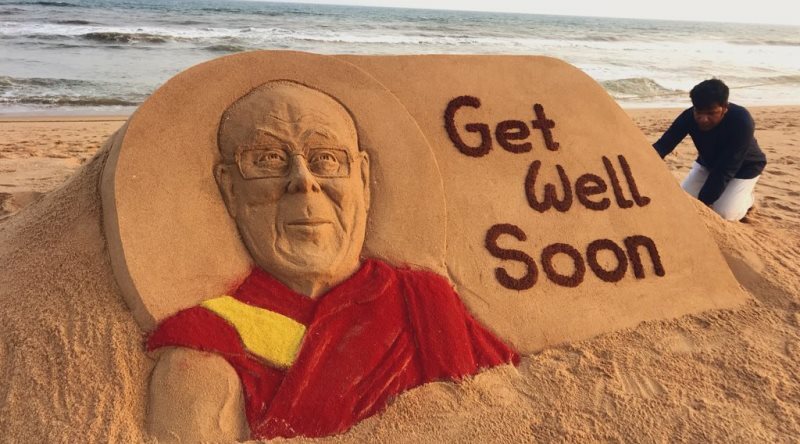 Pattnaik created the sand sculpture wishing the 83-year-old Buddhist monk to ‘Get Well Soon’. The Padma Shri awardee sand artist also took to his twitter handle and shared the picture of the sand art with a thoughtful message. The Nobel peace laureate is undergoing treatment at a Delhi-based hospital. He was admitted to the hospital with a chest infection. The Dalai Lama’s private aide Tenzin Taklha said he was flown to Delhi from his hill town base after complaining of discomfort.